Jewish holidays, keeping organized and having a friendly reminder of Jewish traditions: that's what these Judaism calendars and planners offer in one affordable package. I don't know what it is about Jewish people, but for some reason there are planners available inspired by Judaism that cover the Academic year, when there aren't any for Christians let alone Muslims or Buddhists. The text in Hebrew letters features six letters of the Hebrew alphabet plus ten illuminations - six of which are new - of significant Jewish concepts, such as Tiferet (splendor) and Yehi Ratzon ("May it be Your will"). His Illuminated Psalms Wall Calendar is equally beautiful, featuring the text of some favorite psalms in English. Note though that the only thing 'Jewish' about this calendar is the psalms. 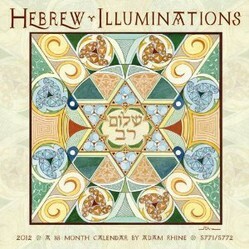 This calendar does NOT have the Jewish holidays or anything like that, unlike the Hebrew Illuminations series. Adam Rhine combines watercolor and acrylic with a spiritual vision and a sense of beauty that will lighten up any home. The Jewish Art Calendar by Mickie is similar in style to the work by Adam Rhine, and it too covers September through December. Mickie Klugman-Caspi is an Israeli-American artist and calligrapher who has been specializing in Judaica since 1980. Her work uses traditional Jewish motifs as well as Arabic and Persian patterns, and is inspired by Art Nouveau. Her love of gardening shows through in the natural patterns that get incorporated in her work. The Jewish Museum in New York comes out with a wall calendar to accompany their date book. Unlike the planner, the wall calendar features modern art by Jewish artists Max Weber, Marc Chagall, and Edouard Vuillard. 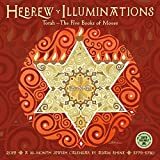 Of course it includes includes major and minor Jewish holidays, days of the Jewish year, weekly Torah readings, candlelighting times for selected cities, and blessings to be said over the candles. The Amsterdam Jewish Museum has produced a beautiful more classic looking wall calendar this year. You'll find information on Jewish holidays and observances, as well as selections of Judaica and fine art. Beautiful and stylish this calendar goes very well with the planner by the New York Jewish Museum. Last but not least the Jewish Celebrations Calendar is a fun family wall calendar featuring the art of Malcah Zeldis a US-Israeli artist whose work is reminiscent of folk as well as modern art, and whose vibrant colors will brighten up any home. She incorporates Jewish folk tales and celebrations as well as her heroes into her paintings. I think it has something to do with the Jewish entrepeneural spirit, combined with having their own traditional calendar. The New York Jewish Museum comes out with an annual 'The Jewish Calendar' which spans spans a full 16 months, from September through December the following year as a matter of course. As it should be, because it's just practical to have a planner to cover the academic year. Though I suspect in this case it's more about the Jewish year 5773. The New York Jewish museum puts one of their top of the line pieces on the cover each year. This year it's recognizably Jewish for anyone: a menorah. J Levine/Millennium also comes out with a date book for 5773. In a more classic light blue, it's a 17 month planner starting August 2013, also lasting all through December 2014. It's rather large, as an executive planner ought to be, opening to 17" x 11". Plenty of room for appointments each hour. Both these planners make a great gift for any Jew in your life. The Joy of Jewish Humor: Day-to-Day Calendar is a fun tribute to Jewish culture. This desk calendar keeps it light, yet stays in touch with Jewishness all over the world. Included are quotes from famous Jewish celebrities, "Yinglish" phrases and lingo, jokes, and funny anecdotes. From Eastern Europe to the Borscht Belt, The Joy of Jewish Humor is just what you need at the office. .
You’ll be reminded of US as well as Jewish holidays and Sabbath candle lighting times. Kids sometimes struggle with the reading of the Haggadah at the Passover Seder. As the scriptural commandant of “telling our sons” of the liberation from slavery and leaving Egypt is done, the story can be long and difficult for children to understand, especially if they are of preschool age. Reminder stickers are a fun way to make certain events stand out on your calendar so that you do not overlook something important like a birthday. These Jewish calendars and planners are beautiful. Handy too, with the extra months they include. A Bar Mitzvah is almost like planning a wedding, except you are not celebrating a marriage, but instead a coming of age. We have just heard that President Trump has recognized Jerusalem as Israel's capital and decided to move the US embassy into it.